Yesterday Judicial Watch reported that only three United States airports require security checks on their employees. If Judicial Watch knows this, does anyone believe that people with nefarious intentions are not also aware of this? It might be a really good idea to correct this situation quickly. 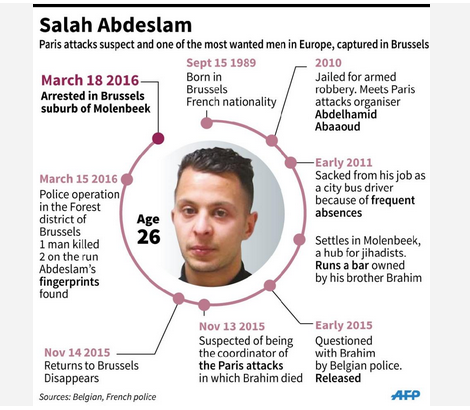 Yahoo News is reporting today that Salah Abdeslam, the last surviving member of the team that carried out the terrorist attack on Paris, has been captured. This man was born in Brussels. He was considered a French national. The article reports that he had evidently planned to blow himself up with a suicide vest, but changed his mind at the last moment. A suicide vest was found in Paris after the attack in an area Abdeslam’s cell phone indicated that he had been in. Another of the Paris attackers, Bilal Hadfi, was last week buried quietly in the same cemetery as Abdeslam’s brother. Abdeslam and his brother had run a bar in the area until it was shut down by the authorities a few weeks before the Paris attacks. It is frightening to think that ISIS is successfully recruiting western-born terrorists for suicide attacks in Western countries. This man would have easily been able to come to America on a French visa. That thought is troubling. On Monday, Front Page Magazine posted an article about a speech made by Czech President Milos Zeman on the 26th of May 2014 at the Hilton Hotel about terrorism. “Let’s throw out political correctness and call a spade, a spade. Unfortunately, there has not been a lot of press coverage of this speech. This is the policy the world needs to adopt in dealing with terrorism.